Microsoft recently introduced two new features to Office 365. One is the new Sway, which I believe Alexander Bradley introduced as the “first Office product to fully step away from the paper metaphor”, and the other is the new Blog. Sorry, that was a slight detour. I feel a personal rant coming on, about service maintenance teams who prefer new features to service improvements, but I’ll save it for another post. I do see the point of what they’re trying to do though. 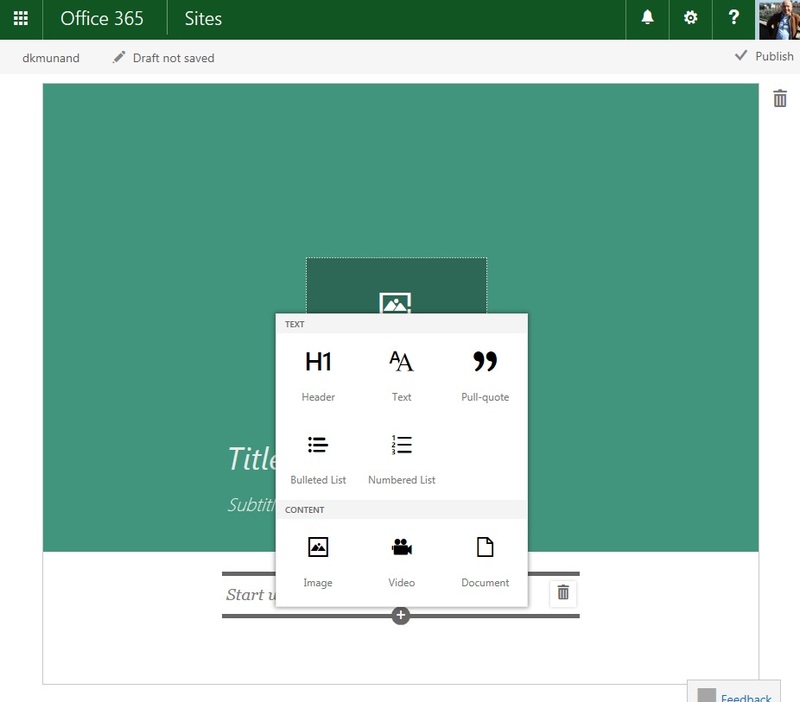 Both the new Office 365 blog and Sway uses a format that automatically formats itself to the platform you watch it on. It looks awesome whether you watch it on a phone, tablet, watch (not really, but hey), laptop, or Smart TV. Content is becoming “online native” instead of designed for printing out. In this way, it is part-and-parcel of a trend, where content is becoming “online native” instead of designed for printing out, and this is something I can fully get behind. Since it’s introduction in the early 70s, the “paperless” office has been a somewhat hollow slogan, with paper usage increasing steadily, and these days, people are more likely to give you a paternal pad on the head or laugh at you outright if you bring it up. It’s not a stupid goal though. Paper is great for many things, but trying to bring down consumption, or at least curb the increase, will have many benefits, and until we do, we can’t really consider ourselves digital natives or get the full benefits of the digital platforms we’re investing in. We need to move on, and native online content is a major part of that story. Sway is by far the more mature of the two. It splits content into “Cards”, which will then be scaled, depending on the size of your screen, to look as good as possible. Some Cards are interactive, while others just show content, and you can choose a vertical or horizontal layout, the colors, fonts, etc. After you’re done, Sway will add some animation to what you’ve done, and the browsing experience is pretty nifty. However, this is very much an early-edition product, and the control is rudimentary at best. Expect to spend a lot of effort fiddling around with it, and expect to finally get it “just right” in your own browser, just to be sorely disappointed and have to re-do it again after you see it on your mums laptop. As a long-time music-producing enthusiast, I feel the developers’ pain here. You can work endlessly to get a mix “just right” in the studio and then have to re-do everything after hearing it on a pair of cheap headphones. But this will get better. I understand the journey they’re on with this product, and Sway is a pretty good first step. Where to start. Obviously the guys who implemented this, aren’t on my good side to start with, after force-feeding me with it and removing my old blog in such a rude and non-negotiable manner. But even if I try to work up just a fraction of the excitemenet I have for the Sway-journey , I have to say that the new Office 365 blog, seems more a beta-test than something that should have been released into the wild. 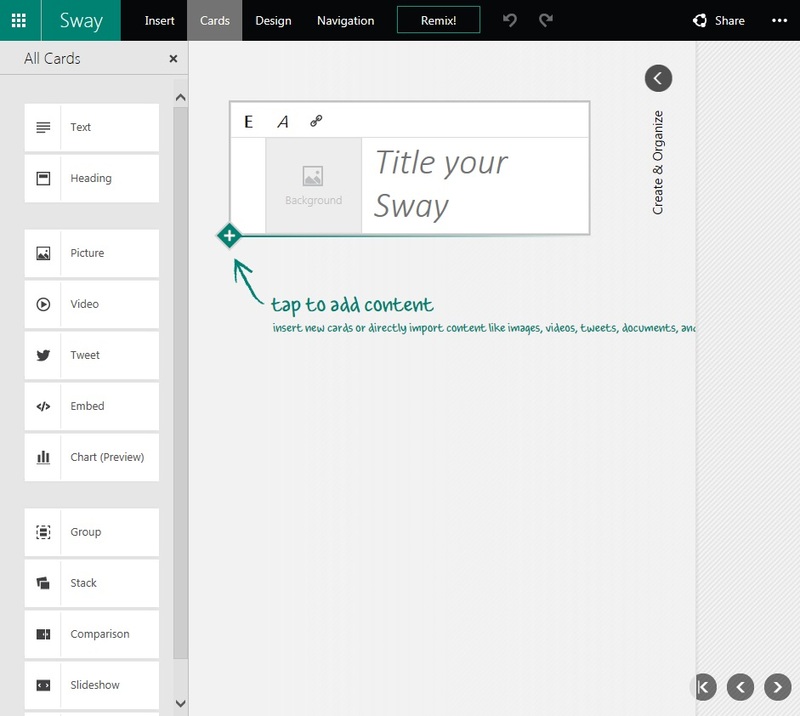 Firstly, in spite of using the same basic principle as Sway, they decided to change the UI completely. All you get is this large green box, that takes up most of your browser window, and hints at lost UI opportunities. The layout is different; the ability to shuffle tings around is gone; there is no way to preview; all you get is this large green box, that takes up most of your browser window, and hints at lost UI opportunities. And why rename “cards” into “hints”? It makes no sense! My best guess is that it’s some Bing translation gone awry after someone decided copy/paste was too complex. Well, I guess it will improve. Next time, don’t be so eager on the “publish-to-production” button guys. Well, as you may have surmised , I fully support the overall principle of what is being attempted, but I’m not altogether happy with the consistency and maturity of how it’s being done. So far, Sway is a fun tool that may find some limited use, but adding content to the new blog, will primarily be a content-migration effort in hopes of future improvements. But even sticking to content-migration, isn’t risk-free I guess. Now that content is no longer the post itself, but split into cards/hints, I no longer have any assurance that the card/hint won’t be discontinued. I.e. I may keep my post, but I risk it being gutted from the inside and start to look really strange as the product matures. This doesn’t mean I wont stick with it and try migrating a few things. If the direction is right, I’m sure MS will put the necessary effort behind this, to make it work over time. An obvious improvement could be to add a “navigation card” category, as hinted in the original blog-post, and allow threaded navigation instead of just linear horizontal/vertical scrolling. Another could be cards to add “old-style” Office content like slides and Excel sheets. A third, could be better scaling, so the cards fit within the platform you watch them on, instead of opening in new windows. But I’m sure they’ll get to that. For now I’ll just stick with it and see what happens.